CONDITIONS: The Puget Sound Tournament Committee reserves the right to alter the conditions and schedules herein. The Committee reserves the right to reject the entry of any applicant, at any time, for any reason. Any decision by the Committee, in any matter, shall be final. Players will be presented with the supplemental rules "Hard Copy" prior to teeing off. TEE TIMES: No preferred pairings. Times will be available on May 17th on this webpage. 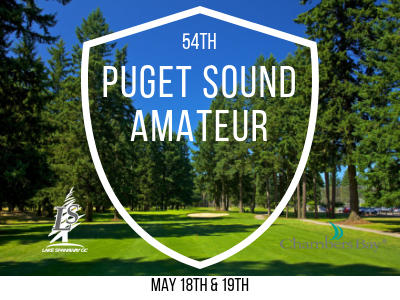 REGISTRATION: Pairings will be emailed to all participants as well as posted on this page on Friday, May 17th. Please arrive at a minimum of 1-hour prior to your round 1 starting time to register for the event.